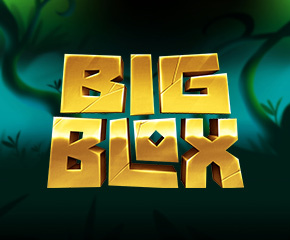 In Big Blox slots by Yggdrasil Gaming, you are taken to a remote South Pacific Island. Here, you get to see the relics of a long forgotten and ancient civilisation. This video slot comes with a pretty decent visual display and also impressive sound effects to match. You have a Big Block bonus feature in this slot with multipliers to boost your payouts. Continue reading for a bit more details about this online slot. Big Blox is a video slot with a 5×3 reel structure and no standard paylines. What you have instead is a 243 ways to wins format. With this format, the players can form combo wins from left to right on adjacent reels. The 5×3 reel structure spins while being placed against an ancient stone relic. The background is dark with ancient artefacts scattered around and partially covered by dense undergrowth. There are four symbols of high-value. These symbols are actually ancient stone masks. 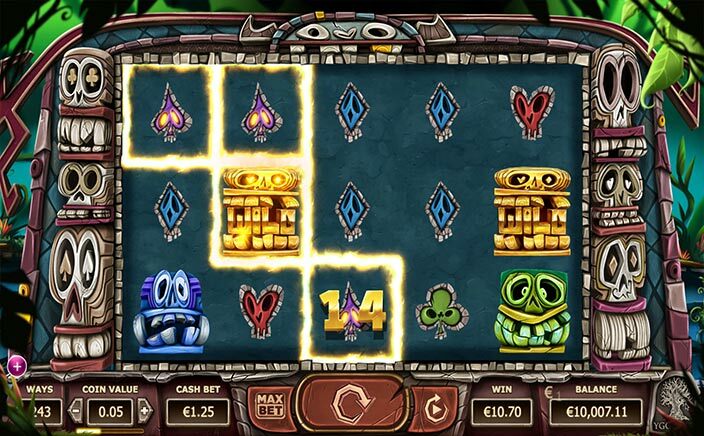 You have a Blue, Gold, Green and Purple coloured Stone Mask in this slots game. On the other hand, the symbols of low-value are playing cards of Diamonds, Clubs, Spades and Hearts. These playing cards are designed to reflect the theme of the video slot. For the Wild symbol of this slot, you have a large gold coloured Wild symbol. This Wild will displace other symbols on the reel structure to help boost your wins. You can see this Wild on reels 2, 3, 4 and 5 only. During the base game, the colossal symbols of between 2×2 and 5×3 can randomly appear on the reel structure. With these colossal symbols on the reel set, you will earn combo wins and a win multiplier equivalent to the number of matching icons on every reel. In Big Blox slots, a colossal Wild icon may all show to help boost your wins and payouts. This colossal Wild will show up only on reels 2, 3, 4 and 5, but not on reel 1. The colossal symbols of Big Blox slots will really give the players something to ponder on. You can also start off a game with as little as 25p (minimum) per spin or as high as £100 (maximum) per spin. There is also a jackpot prize of 400x your total bet to be won in this video slot.